The final Assembly of Major Superiors of the Order in this Sexennium is meeting in Rome, at the General Curia, from 24 to 28 September, 2018. It is attended by all the Provincial Superiors and the General Delegate, and was inaugurated with a celebration of the Eucharist, at which the Superior General, Brother Jesús Etayo, presided. In his opening address, Brother Jesús briefly recalled the purposes of the Assembly, which had essentially been planned as a formation event, mainly to help the Provincial Superiors, especially those elected for the first time by the recent Provincial Chapters, to familiarise themselves and fully take on their role as leaders and guides, to instruct the Provincial Superiors regarding the responsibilities of their mission, according to Canon law and the Order’s proper law, and to acquaint them with the Secretary’s Handbook, and the most important and commonly used procedures and protocols in the life of the Provinces. He then spoke to numerous important matters regarding the future of the Order. 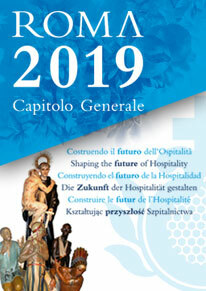 Referring to the title of the forthcoming General Chapter, “Shaping the future of hospitality”, he focused on the figure of the leader which the Order needs today if it is to respond to the demands of the mission, society and the Church in the light of the Gospel, under the guidance of the Holy Spirit. Fr David Glenday, MCCJ has also addressed the meeting on “The art of governing with humanity and the Spirit”, while Brother Brian O’Donnell’s paper was entitled “The responsibility of the Superior according to the Constitutions and the General Statutes”. The agenda also includes formation sessions on other matters, and working groups. On Thursday evening the participants have been invited by the Rome Province to attend Vespers at San Pietro Hospital, the headquarters of the Rome Provincial Curia, followed by a fraternal supper.